For Himeji Castle, take the local line from JR Osaka Station to JR Himeji Station; the castle is 20 minutes by foot from the station. For travel back to Tokyo and Osaka, take the Express “Marine Liner” from JR Takamatsu Station to JR Okayama Station, and transfer to the Shinkansen from there. The climate of Okayama and Kagawa Prefectures is so gentle that the region truly lives up to the designation “Hare no Kuni,” “The Land of Clear Skies.” Part of the charm of this region lies in the harmony between the gorgeous scenery and tranquil environment of the Seto Inland Sea, and the artistically designed gardens and historical architecture which blends organically with this exquisite environment. 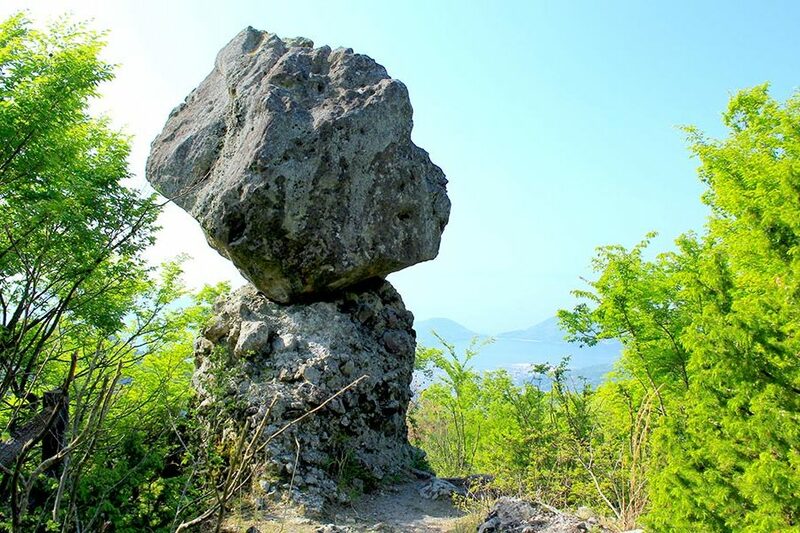 For those seeking a more relaxed pace, this itinerary offers a journey around some of the most beautiful areas of Setouchi, allowing you to experience the healing touch of art and nature. 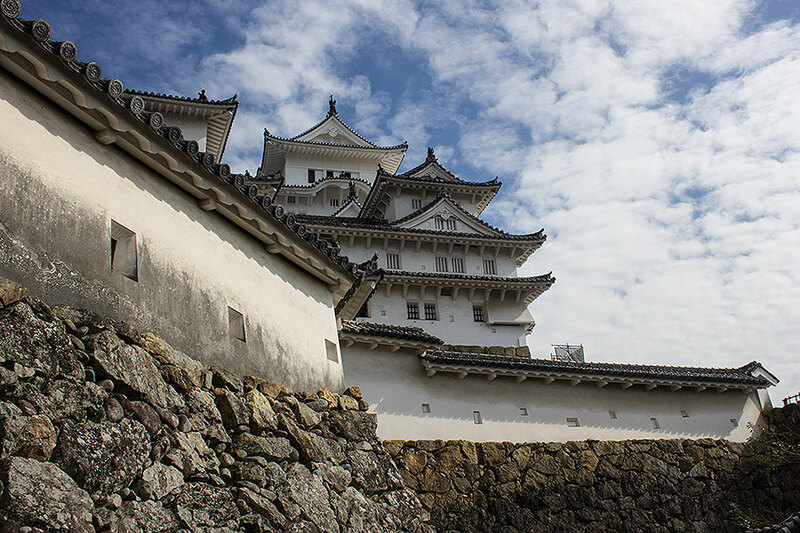 Himeji Castle is not only the largest and most frequently visited castle in Japan, it is the closest existing approximation of what a castle complex would have looked like in feudal times. The castle dates back to 1333, and periodic expansions have resulted in a network of 83 buildings that simultaneously give an insight into castle life, and a crash course on defensive architecture. 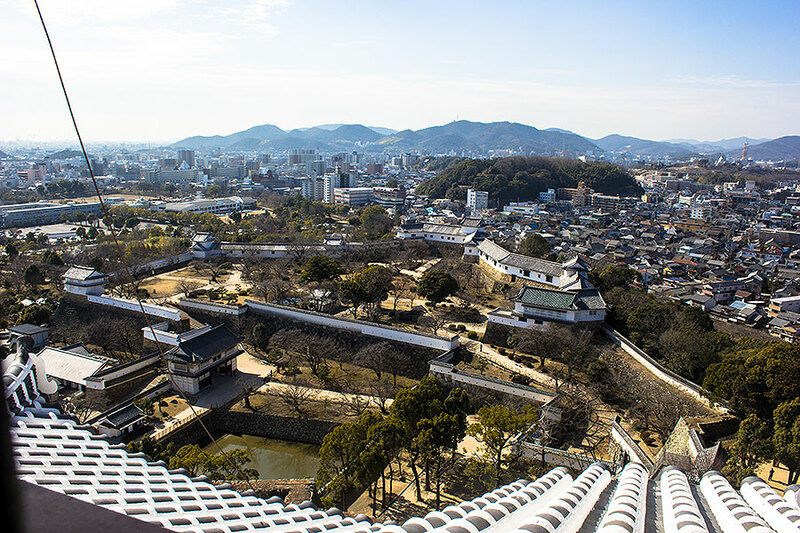 Himeji Castle’s claim as one of the country’s most iconic structures was confirmed with World Cultural Heritage status, one of the first places in Japan to receive this recognition. Just next door is Kokoen, a wonderfully compact collection of nine different styles of traditional Japanese garden. 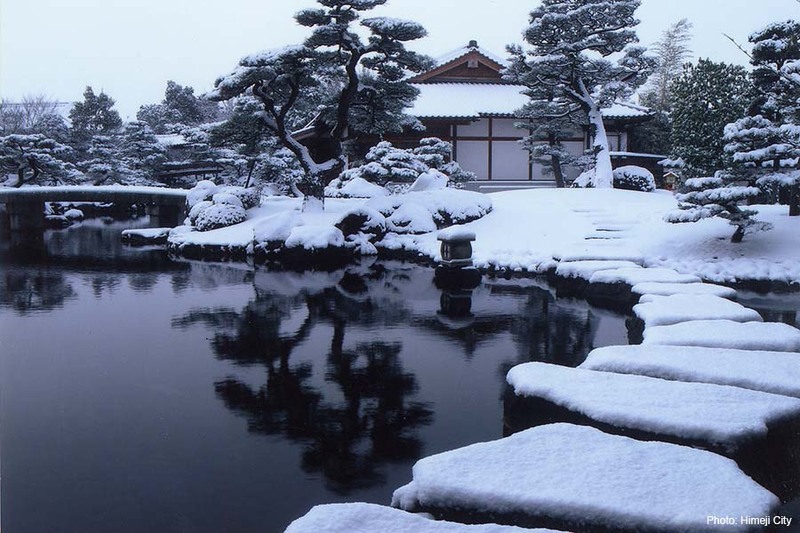 Designed to showcase the manicured beauty of Japan’s relationship with nature in all four season, a stroll through the quiet gardens provides a visual feast, one well complemented by a visit to the pond-side teahouse for refreshments. 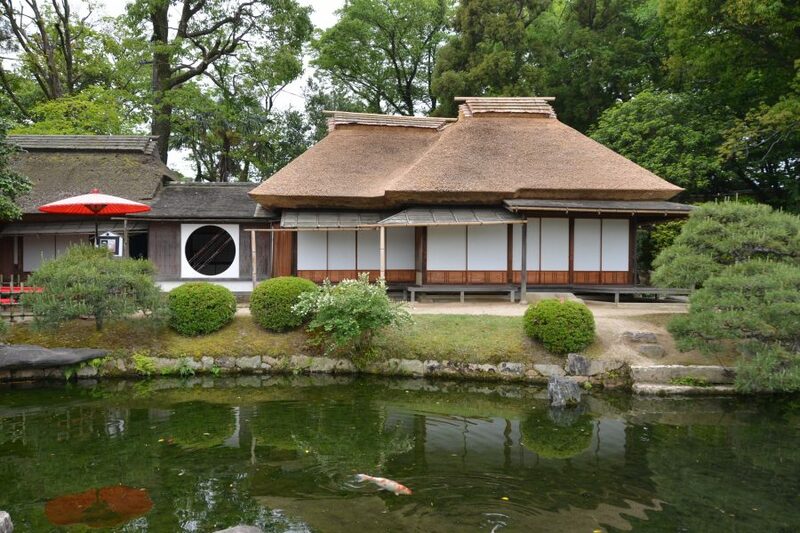 While in Okayama, don’t miss the chance to visit Okayama Korakuen, conveniently located close to JR Okayama Station. There you’ll find the pinnacle of Japanese garden design — one of the Three Great Gardens of Japan, and winner of a coveted three-star rating from the Michelin Green Guide Japan. The view from the garden’s Yuishinzan Hill alone received a two-star rating. The garden is majestic, with a total area of about 144,000 square meters. 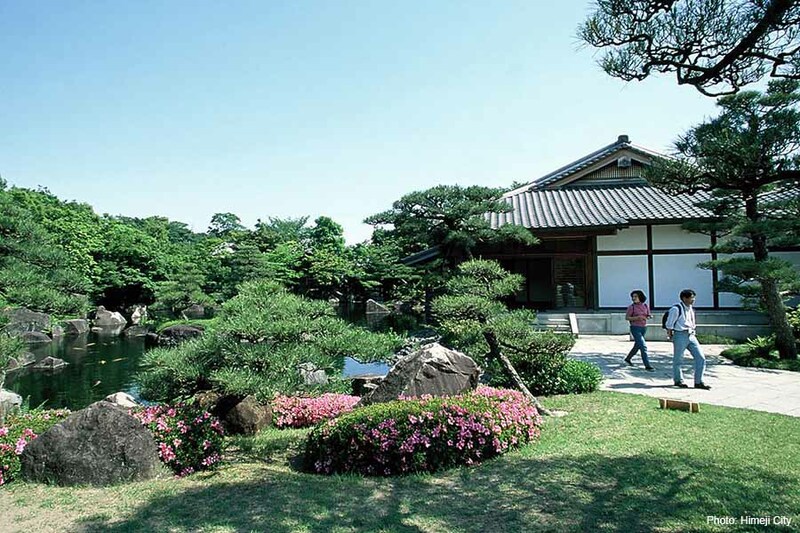 As an expansive greenscape with a pond at its center, carefully designed walking courses, and an artificial hill, Okayama Korakuen is considered to be a model of the chisenkai yushiki style of garden design. In spring, enjoy plum, cherry, and azalea blossoms. In summer, Japanese iris and lotus flowers. In fall, delight to the glorious colors of maple and ginkgo leaves. 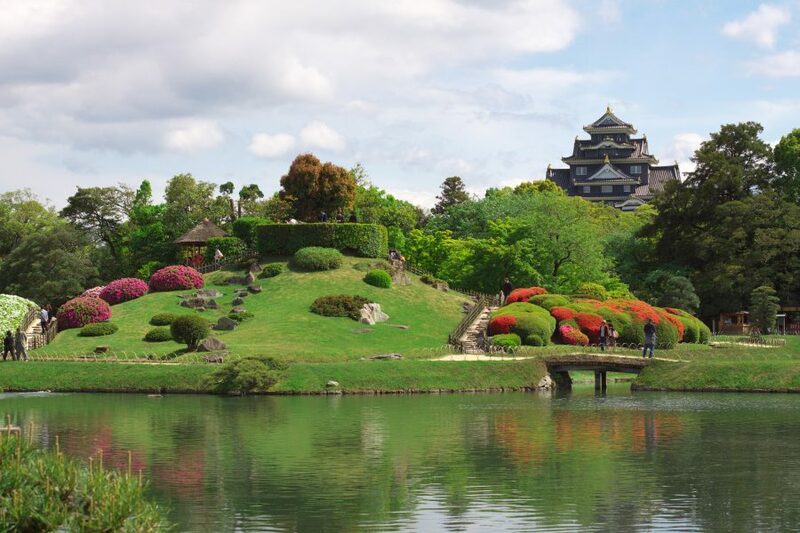 This is an essential destination for the visitor to Okayama, and a stunning example of Japan’s cultural heritage. An Okayama Korakuen bus is available to take you directly to and from JR Okayama Station, unless you prefer to take a tram or enjoy a relaxing stroll. 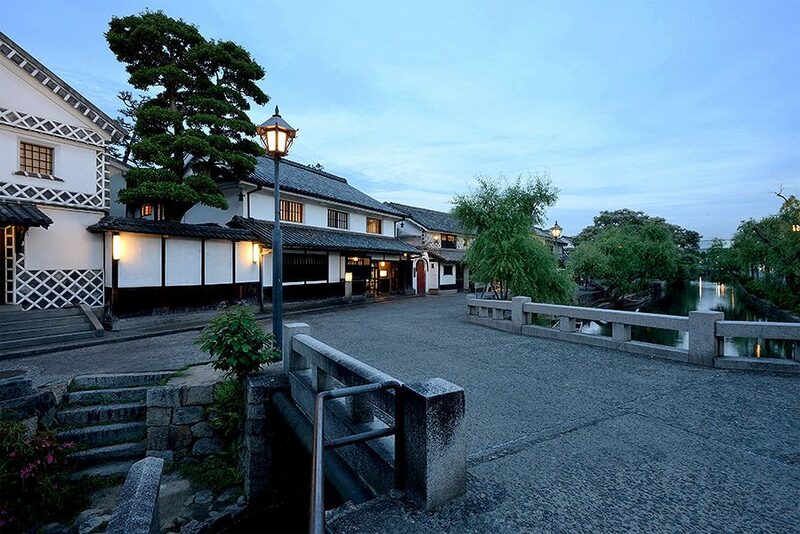 The long-established traditional Japanese inn, Ryokan Kurashiki, nestles on the bank of the Kurashiki River in the very center of the Kurashiki Bikan Historical Quarter, only 15 minutes by foot from JR Kurashiki Station. 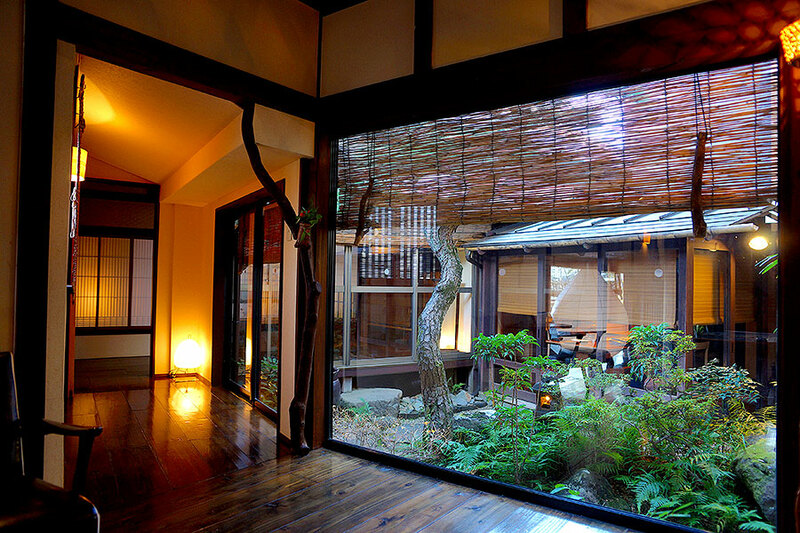 A refurbished late-Edo residence and sugar storehouse, the ryokan has only eight guest rooms, each tastefully designed with the comfort of guests in mind. At night, you can enjoy the romantic illumination of the historical quarter’s streetscapes from your window, as you relax and restore your energy after your travels. 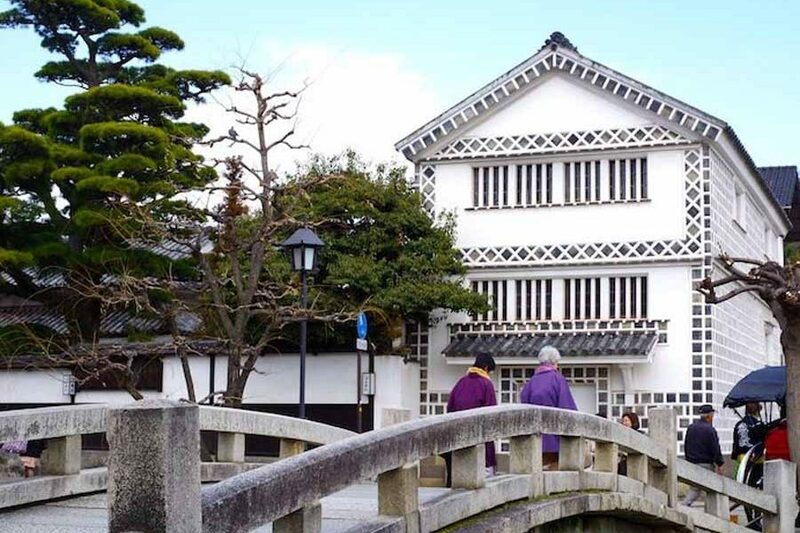 Take a step back in time to visit the Kurashiki Bikan Historical Quarter in Okayama. 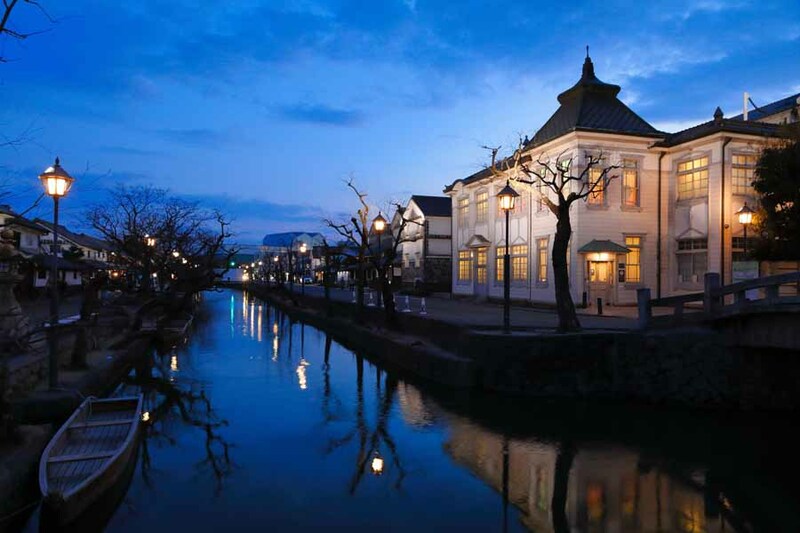 A bustling center for trade in the Edo era, it relied on the Kurashiki river to move large amounts of goods in and out of the city’s storehouses. Walking down the quaint streets with their well-preserved buildings is a visual feast, and taking a boat ride on the canal only makes the view more impressive. Museums, traditional-style shops, and modern specialty stores will keep you browsing for hours. Maybe even take a historical stroll wearing a rental Kimono. The evening lights bring a different pace and feel to the area, and a chance to see the magnificent illuminated buildings reflected on the still river water. 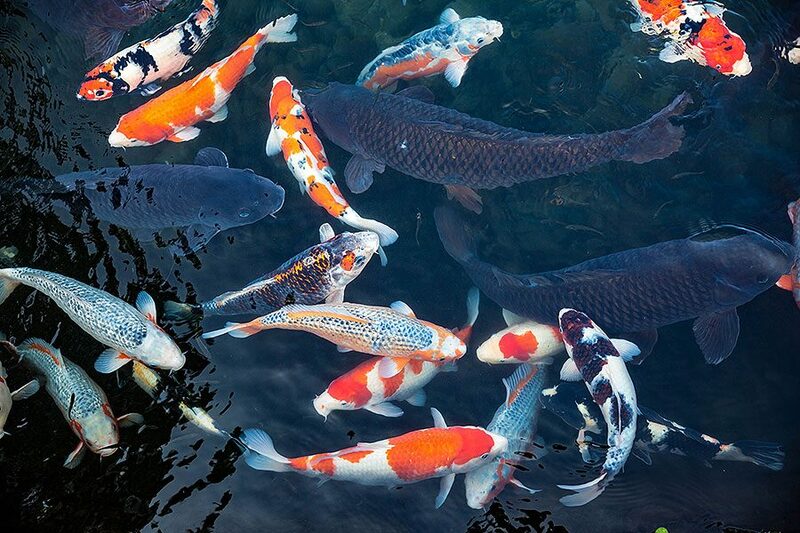 Kakushi-zushi, or “hidden sushi,” is a famous Okayama dish based on a legend from Edo times. As the story has it, following a decree from the daimyo that forbade luxurious dining, local people still wanted to excite their taste buds, even if they had to hide their food while doing it. They would, therefore, conceal their tasty morsels underneath a covering of rice on the bottom tier of their bento boxes. 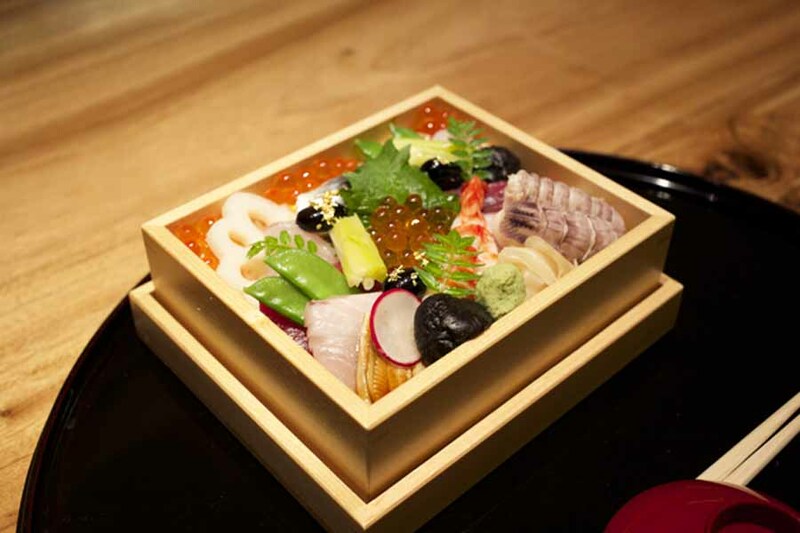 The kakushi-zishi dish offered by Kibizen, a Japanese restaurant located within Hotel Granvia Okayama, is a famous and much-loved modern variation. 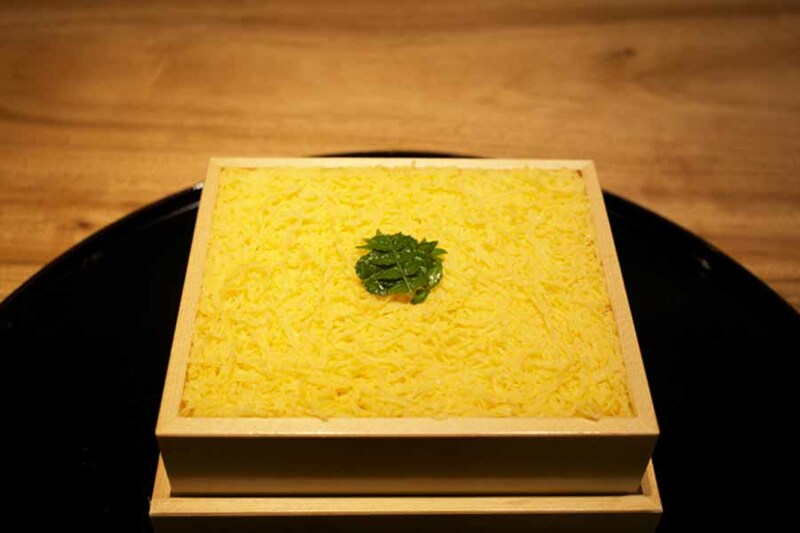 Diners are presented with a box apparently containing white rice with a topping of thinly sliced omelet. Artfully concealed on the other side of the box, however, is an array of tasty fish, shrimp and vegetables. 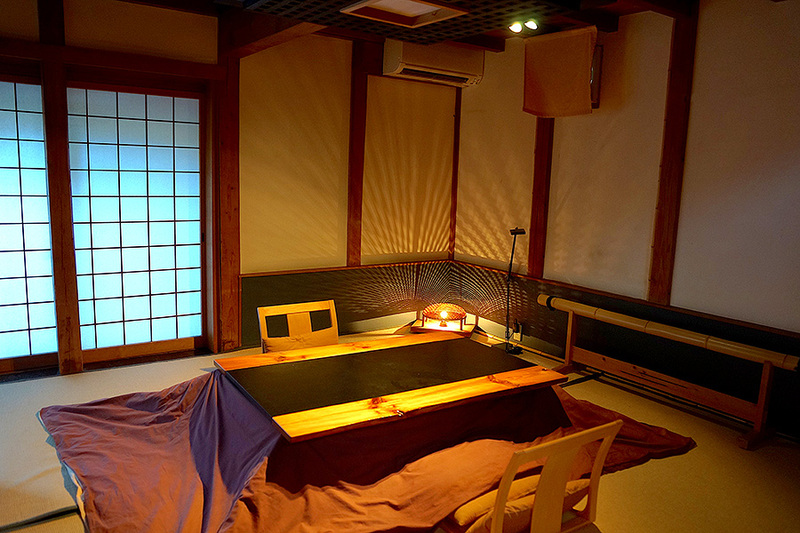 Come to Kibizen and get a taste of old Edo – but be sure to order in advance, because the secret is out! Tonight’s accommodation, the boutique, hotel-sized Island Ryokan Mari, is located in a part of Shodoshima Island affectionately known by locals as the “home of soy sauce.” While Mari only has seven rooms, each one represents the epitome of elegant Japanese design. 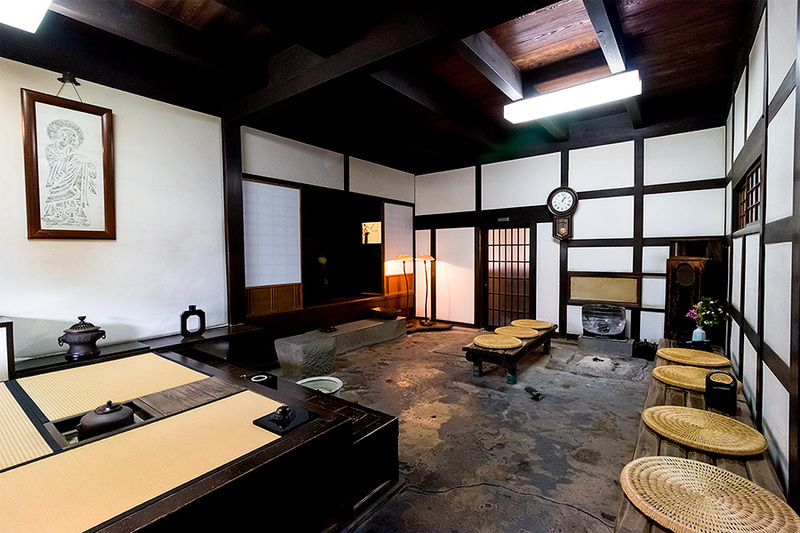 Mari also offers luxurious indoor and outdoor bathing options, and the rejuvenating hot spring water drawn from below the ryokan is said to be exceptionally good for the skin. 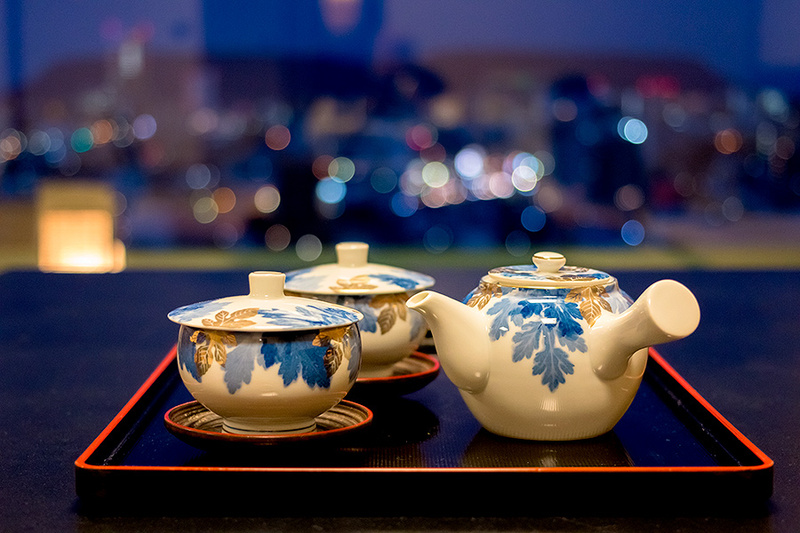 But divine as the water may be, the highlight of any stay at Mari is undoubtedly the exquisite set menus the ryokan provides for dinner and breakfast. Each meal is both a gastronomic treat and a local history lesson, as dishes are created to emphasize the high-quality local ingredients used, and the connection each dish has to local producers and the history of Shodoshima. Expect fresh local fish and delicious, locally-grown olives to feature prominently. However, the headline act is, unsurprisingly, soy sauce, to be had in its many forms and stages of maturation. You will never look at this humble sauce the same way again. Let your stay at Mari help you relax into island pace, and you will surely come away fulfilled, relaxed, and ready for the next day’s challenges. A highlight of any trip to Shodoshima is a trip to Kankakei Gorge, one of Mother Nature’s most spectacular feats of artistic creativity. Millions of years of constant erosion following a massive volcanic eruption underneath a lake have sculpted an amazing succession of ridges and stone formations. The gorge is famous for its explosion of colored leaves during the fall, but the natural environment is spectacular all year round. 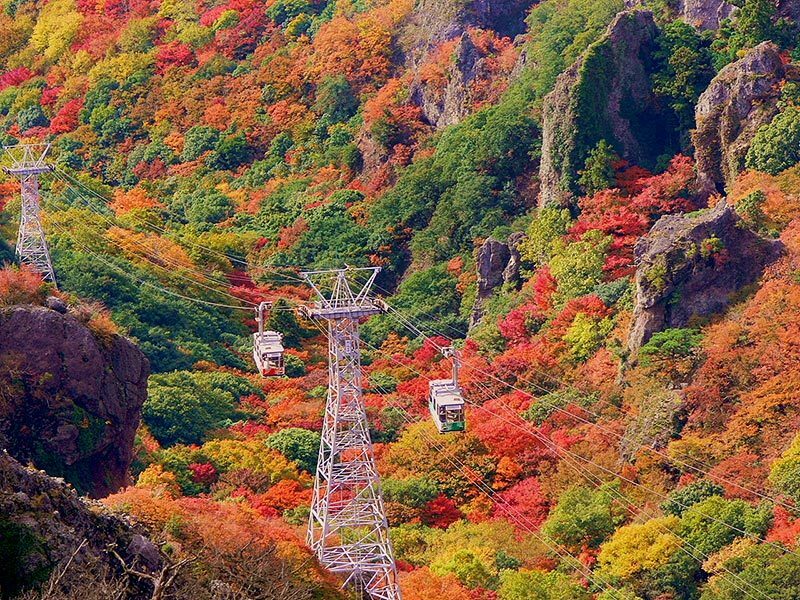 Take the 917-meter-long ropeway car up to the top of the gorge to see one of the most breathtaking vistas of the Seto Inland Sea. It is possible to catch public transport to the ropeway station, but rental cars and hire taxis will give you more flexibility in scheduling, and help you move around to see other attractions on the island. Shodoshima has long been known as an agricultural region and for its processed foodstuffs, including soy sauce, sesame oil, and, in more recent times, olive oil. 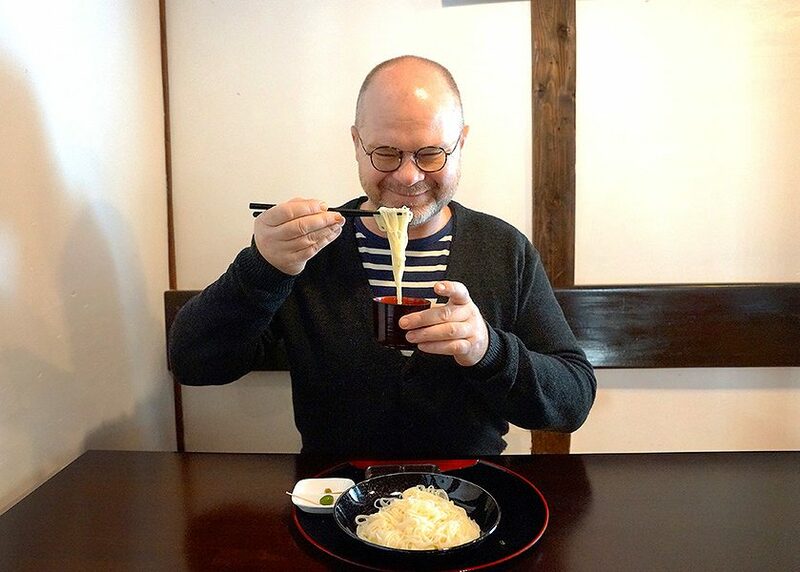 But if there is one product that any visitor to the island is sure to want to take home as a souvenir, it must be the island’s famous, hand-stretched soumen noodles. The noodles have a more than 400-year history on Shodoshima, and during the local soumen industry’s Meiji era peak, 650 companies were making this thin noodle, best eaten cold on a hot summer’s day. Soumen is still an important industry for the island, and some factories offer tours of their plants. 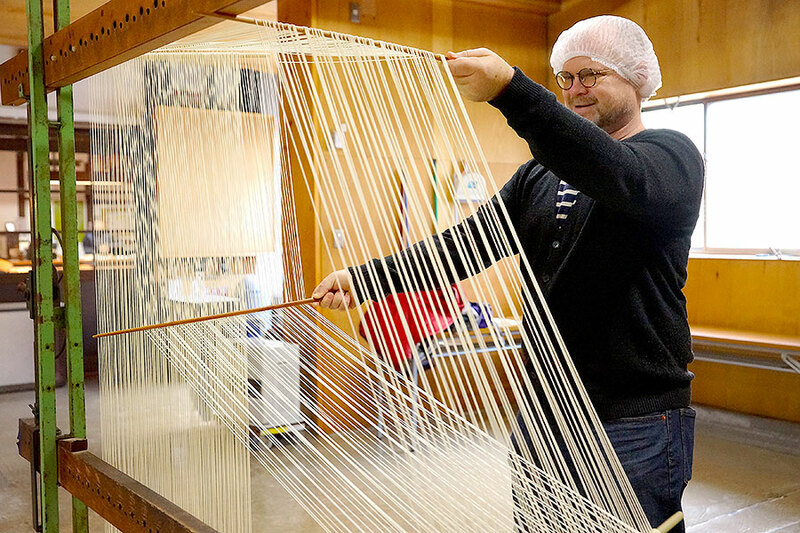 One such factory, Nakabuan, even offers visitors the chance to experience hand-stretching and separating the noodles with oversized chopsticks. Great preparation for tucking into a bowl or two of some of the Japan’s best noodles in the adjacent cafeteria. 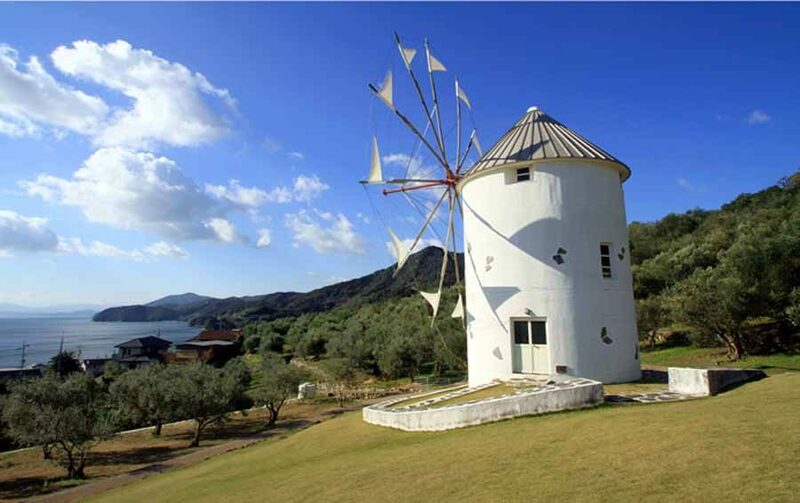 Cap off your Shodoshima sightseeing experience with a visit to the Shodoshima Olive Park. 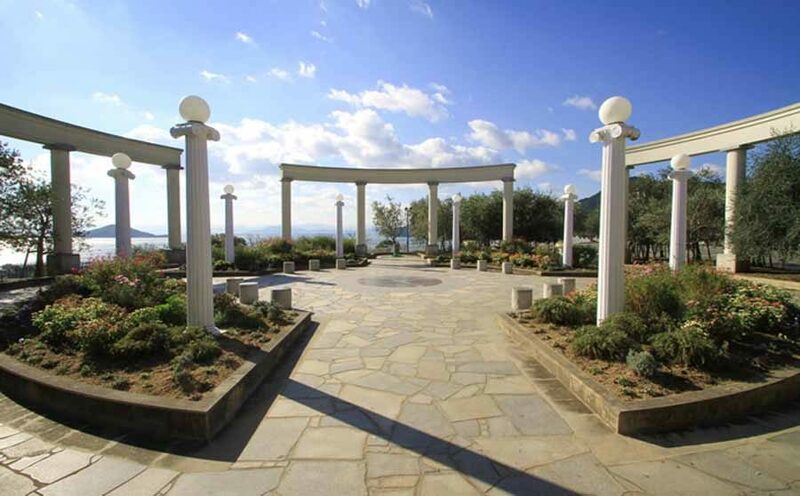 Located on a small hill overlooking the Seto Inland Sea, the Shodoshima Olive Park is home to approximately 2,000 olive trees and features more than 130 different herbs. The park’s herb greenhouse offers the chance to experience olives and herbs with all your senses (booking required). The grounds also feature an Olive Memorial Hall, an auto-camping area, and a natural hot spring. 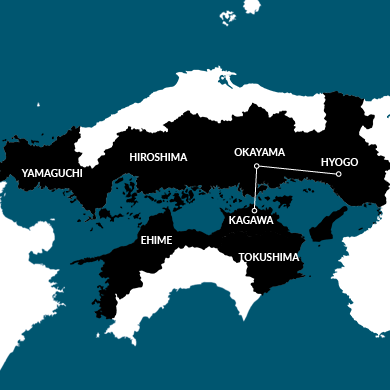 For accommodation, take a ferry or high-speed boat to Takamatsu City. If you want a place to stay in Takamatsu City that will linger in your memories, look no further than Kiyomisanso Hanajyukai. Located on the east side of Mineyama Park, Hanajyukai is entirely surrounded by trees and flowers, offering a new experience in every season. 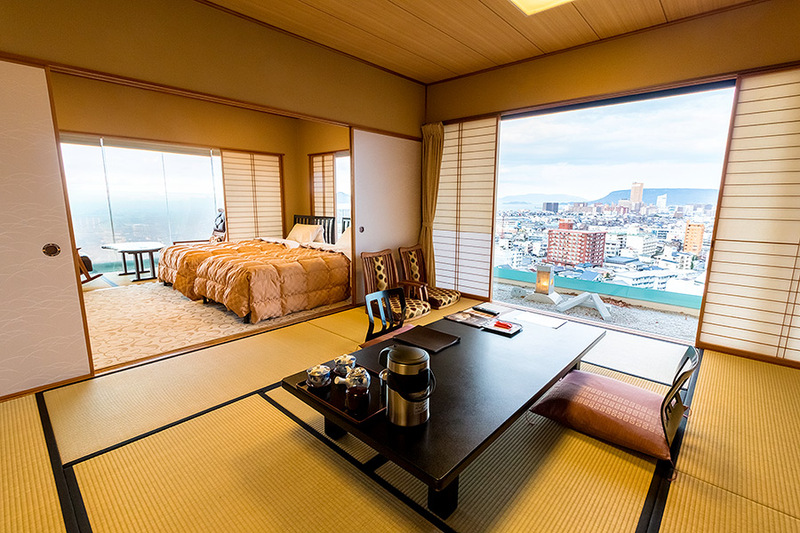 Taking full advantage of the ryokan’s location overlooking both Takamatsu City and the Seto Inland Sea, the panoramic views from your bathtub will hold you spellbound, even as the rejuvenating waters wash away your cares. Transportation to and from JR Takamatsu Station included. 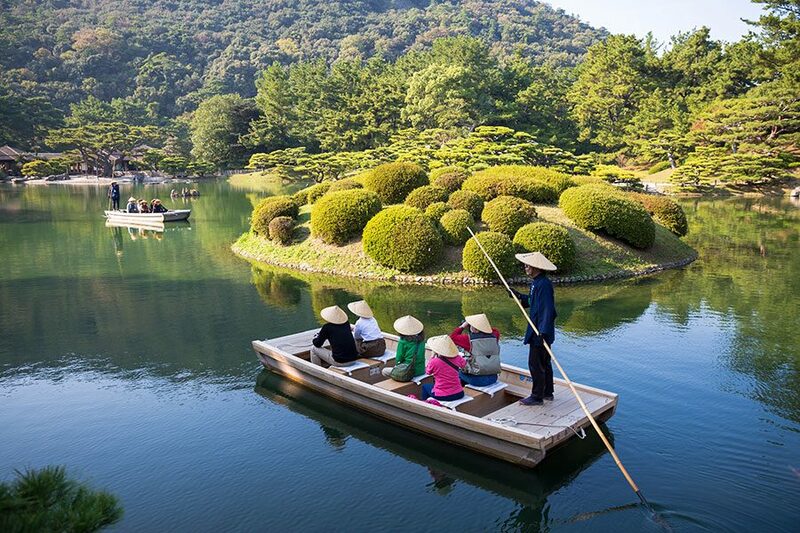 While visiting Kagawa Prefecture, lovers of plants and scenic beauty simply must visit Ritsurin Garden, the largest, and one of the most stunning, Japanese gardens in the country. Construction of this carefully orchestrated masterpiece of nature started in 1625, and took more than a hundred years to reach its full glory. With 1400 intricately manicured pine trees, an abundance of cherry trees, plum trees, camellias, and more, all arranged with an artist’s eye, the strong visual impact and seasonally diverse allure of Ritsurin provides a magnificent experience year round. The large lakes, tiny islands, and artificial hills increase the sense of distance and visual diversity of the garden, while the forested lookout backing the garden further enhances the scale and serenity of the scene. Whether strolling the winding paths, taking a traditional boat ride, or experiencing a traditional Japanese teahouse, spending even half a day in this manicured masterpiece will lift your spirits and rejuvenate your soul. 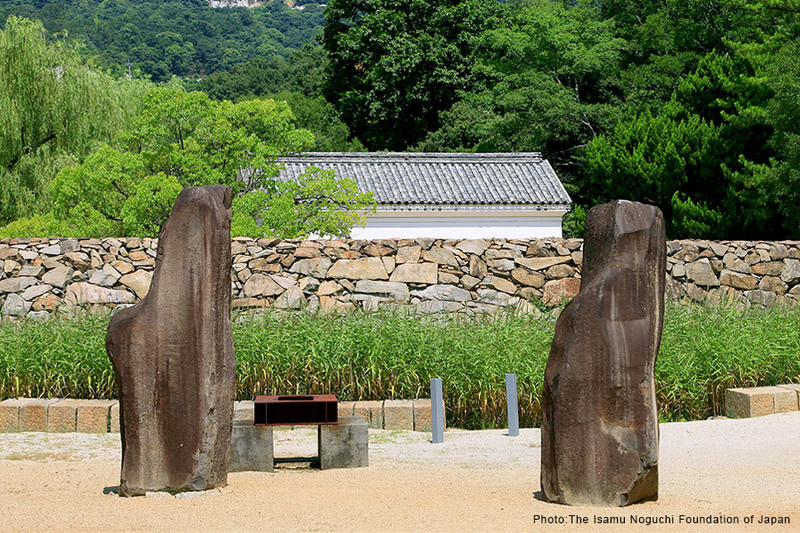 During his later years, the sculptor Isamu Noguchi worked in a studio in the village of Mure, Kagawa Prefecture. Since Noguchi’s death, the studio complex has been preserved and opened to the public as a museum focusing on his work. But this museum is unusual in that it provides the rare experience of allowing the visitor to see works that were still in progress at the time of Noguchi’s death. In addition to the numerous sculptures, including many that remain unfinished, the compound contains an exhibition hall, Noguchi’s residence, and a garden that was created as a sculpture. The whole is in itself a work of art. Visitors are transported into an alternative time and space, in which the atmosphere enjoyed by Isamu Noguchi during his lifetime has been meticulously preserved. After imbibing the atmosphere of this great artist’s life and work, return to the hustle and bustle by taking a bus or taxi to Takamatsu Station.